Cole County (Missouri) Sheriff John Wheeler jovially remarked that he would like to be able to admit that his law enforcement career path is the result of some grand plan; instead, it has been a mixture of being in the right place at the right time while being prepared for the next career step. A native of the small southeastern Missouri community of Risco, Wheeler remarked that he realized he wanted to become a law enforcement officer at a very young age. Following his graduation from high school in 1984, he made the decision to enlist in the Air Force in pursuit of this goal. In April 1985, the young enlistee traveled to Lackland Air Force Base in Texas, to complete several weeks of initial military training. From there, he was sent to Wichita Falls, Texas, to complete training as a Tactical Aircraft Maintenance Specialist. During the training, Wheeler explained, he was introduced to technical aspects of aircraft such as the A-10 Thunderbolt (Warthog), learning the maintenance procedures to troubleshoot and repair any mechanical issues that arose in the aircraft. Wheeler is pictured as an Air Force recruit while attending basic training at Lackland Air Force Base in 1985. Courtesy of John Wheeler. In addition to marrying during the three years he was stationed at England, Wheeler noted that he spent many nights away from his wife and newborn daughter while completing brief tours of duty at bases throughout the United States in support of the A-10 mission. In 1988, he was transferred five hours away to Keesler Air Force Base in Mississippi to undergo nine months of training as an Aviation Guidance Control Specialist. While in Mississippi, his wife remained on active duty at England Air Force Base and raised their family, which had grown in size to two daughters. “After completing the school at Keesler, I was stationed at McGuire Air Force Base, New Jersey, and was trained to work on transport aircraft such as the C-141s,” Wheeler said. “My family joined me at McGuire (where his third daughter was born) and that’s where I stayed until leaving the service in 1992. Following his discharge from active duty, he moved his family to Clarkton, Missouri, and joined an Air National Guard unit in St. Louis. 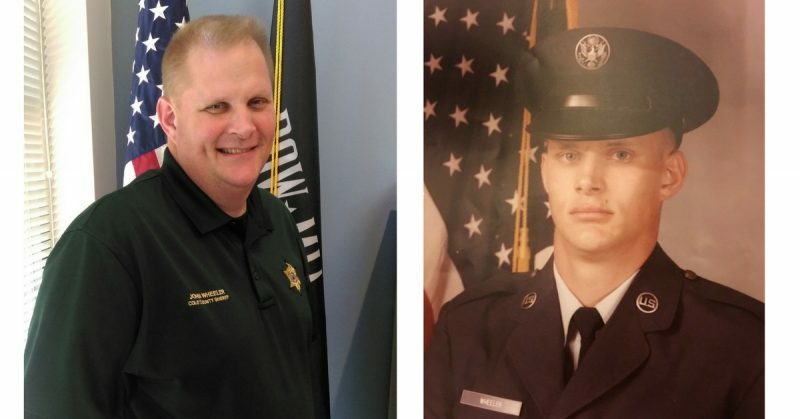 He continued his part-time military career by enlisting in an Army National Guard unit in 1993 and embarked upon a full-time career in law enforcement when the Sikeston Department of Public Safety hired him the same year. Seeking better opportunities for his family, Wheeler applied with the Jefferson City Police Department and was hired in 1997, serving in several capacities to include a DARE officer for the Jefferson City Public Schools. Shortly after his transfer to Jefferson City, he joined a local Army National Guard unit. “I truly enjoyed being with my unit here in Jefferson City,” Wheeler said. “I had the opportunity to train and serve as a helicopter mechanic and was a flying crew chief for the Huey, Bell Jet Ranger, Blackhawk and Lakota helicopters,” he added. Cole County Sheriff John Wheeler completed more than 31 years of military service in the both the Air Force and National Guard. He continues to embrace many lessons from his military service in his role as sheriff. Courtesy of Jeremy P. Amick. While Wheeler continued full-time duties with the JCPD, he took a leave of absence in 2004 when he was once again called to serve his nation in a full-time capacity. As the veteran explained, he returned home after four months of service because of a medical emergency involving one of his daughters. Shortly after his return from Iraq, Wheeler was offered the position of chief deputy for the Cole County Sheriff’s Department by the newly elected sheriff, Greg White. For 12 years, Wheeler served the county in this capacity until he assumed duties as sheriff earlier this year. The veteran has dedicated his life to protecting his community, state and nation while wearing uniforms ranging from that of an airman to a soldier to a city police officer and, most recently, a county sheriff. Despite the many commendations he has received for his public service, Wheeler recognizes important lessons gleaned from his military service, many of which he has used as a leader in local law enforcement.